It’s the end of the world as we know it and I feel…thirsty. Most of the post-apocalyptic fiction I read gives a clearly defined reason why the world went to hell. These days it’s usually a virus, but nuclear war was a major contender in the past. I think it was phased out because it didn’t make as many zombies. 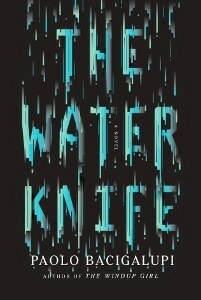 But The Water Knife is a very different kind of apocalypse – in that it isn’t really one at all. But it is. But…now I’m thirsty again. The Water Knife is the story of a man, a woman, and a parched Southwestern United States. Sometime in the not-so-distant future water has become the resource turning brother against brother, state against state, and everyone against Texans. We don’t get much in the way of exposition about the events leading up to the tale covered, but we get bits and pieces as we go. We’re dropped into two places – Las Vegas and Phoenix. Both desert cities, both now desperate for water as The Drought has made their already tenuous détente with their environment nearly non-existent. But like good capitalists, a select number of people have the wherewithal to fight for the rights to the small amounts of water that still runs through this modern day dust bowl. And they are making a killing. Literally and figuratively. Angel works for the iron fist of Las Vegas – he is the Water Knife. He does what his boss orders, blowing up water treatment facilities in disputed areas, installing militias to keep people from crossing borders into states with more water, sometimes just killing stubborn people who need to be killed. An all-around badass, but one who knows exactly what he is and has an extremely cynical, discouraging, and largely accurate view of mankind. Lucy is a reporter in Phoenix. She has been covering the collapse of the city for some time, as have others who report on the number of bodies found in a day, take pictures of atrocities to entertain the masses and are generally around to feed the apocalypse voyeurs. But Lucy is different – she’s really a writer and she has unwittingly become very attached to this dying place. When events arrange themselves (quite conveniently) in a way so as to connect her to Angel as Vegas and Phoenix stand on the brink of open warfare over some missing water rights, Lucy finds that her idealism has a hard time competing with his pragmatism. Through these two quite nicely developed characters we watch as the world turns to dust and people drink filtered urine to survive. Everyone in the story, even a teenage girl, is old enough to remember when things were different, when you could just turn on the tap and drink. So we aren’t very far into this brave new world. That one simple thing makes the whole book far more chilling. And it is chilling – from the scorched environment scientists have been clearly predicting will be our fate if we don’t take drastic measures, to the predictable response of those in power as well as the masses who would rather turn away than face a reality they’ve largely brought upon themselves. Author Paolo Bacigalupi doesn’t have to leap far from our current political climate and environmental policies to get to the place where his story takes place. It’s less of a cautionary tale than a glimpse at a very real possible future. He wraps his speculation around a decent mystery involving water rights but center stage is taken by the people caught in The Drought and how our system reacts to such cataclysmic pressure. Overall it’s a good book – even a very good book. Especially when one looks at it as less fiction and more speculation. What sorts of technologies might arise as global climate change makes our cities less and less habitable? How might we humans adapt and could we do it quickly enough to stave off the carnage he predicts? For some of you The Water Knife will be deeply offensive. Primarily right wing political views will be challenged and mocked, climate change deniers will be shunned and ridiculed. The rest of us will shake our heads in resignation as we recognize those offended parties and the role they play in this very real potential future. This is one of those truly unusual books that you should read – and will also enjoy reading. A rare combination indeed. Highly recommended – 4 ½ stars.